Close to 100 people unplugged from their TVs, cell phones, and digital devices and plugged into the 2014 Warburg Family Day activities held at the arena on Monday, January 17. Participants enjoyed both indoor and outdoor activities sponsored by Warburg Arena Board and the Warburg FCSS. Arena Board President Rob Wenzel was pleasantly surprised at the turnout—no doubt the balmy spring like weather played a part. The kids thoroughly enjoyed the variety of free activities—ice skating at the rink, outdoor broomball, hot dogs and hot chocolate, and a bonfire. FCSS Director Terri Cocke borrowed twenty pairs of snowshoes for the event, allowing the kids to test their skills while trekking high and low over and around snowbanks. Jeanette Ogg said her family was up at 7 AM and off the usual digital devices. She admits they had the radio, though it was mostly in the background, “we were doing stuff while we were listening.” Most parents were pleased with the idea of unplugging on Family Day and that their kids had a convenient location for family friendly activities. Kristen Eliasson, Community Programming and Events Coordinator for the Village of Thorsby, estimates 80 people attended Thorsby’s Unplugged Family Day activities at the Arctic Spas Rec Centre featuring free ice skating in the arena and games in the field house along with free hot chocolate and doughnuts. 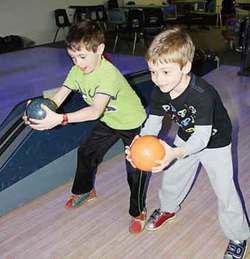 At the bowling alley, it was turn down the lights and crank up the music and black lights. For the craft-inclined, there was a variety of beads and pompoms for kids to create their own masterpieces—lovely princesses and super hero self-portraits in construction paper medium.